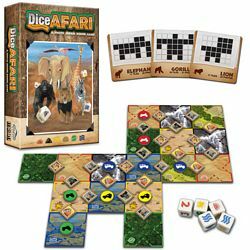 Select a route to visit on the animal-shaped map using strategic dice rolls. But choose wisely, because routes are limited and other players can revisit the areas you select. Then take a photo of an animal that you see before someone else does. Once the entire map has been visited, points are scored for sets of photos taken and the areas most recently visited. The player with the most points wins!